Everything to monitor and manage your online brand in one place. You can see what people are saying about you, who is creating what content, how well email campaigns are performing and how many people are visiting your website. 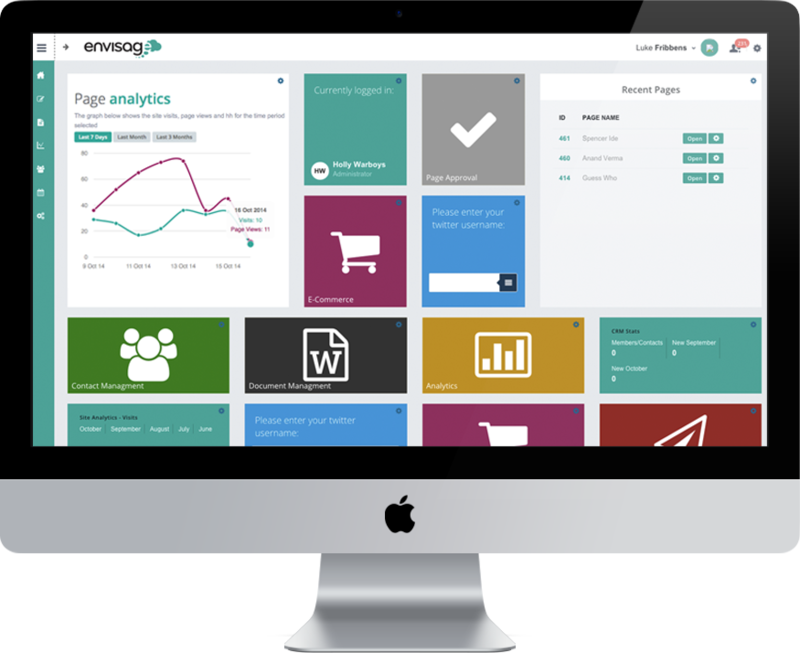 We have redesigned envisage from the ground up. Creating a beautiful and responsive interface which wraps around the real-time WYSIWYG that you already know and love. Our brand new campaign management tool allows you to create elegant and personalized emails. Reporting on your campaigns doesn’t stop at who has clicked on a link; the integration with the rest of your site means that you can see what a visitor looks at, what videos they watch, what events they attend and what documents they download. You can then use this information to further personalize the website. Powerful segmentation tools allow you to personalize your website and emails based on an unlimited amount of characteristics. Our API allows you to adapt envisage to integrate and scale with your organization. We have made it easy to connect to any number of back-office systems seamlessly. You can easily create non linear workflows, allowing teams of people to be responsible for as much or as little content on your website as you want. You can collaborate on online documents to allow different versions to be available to different types of visitor. And with roll back and versioning, you can always undo any changes that are made.